"I had to quit my job as a teacher to find a way to provide for my family," says Yousef, a former primary school teacher from Sanaa now working as a builder. Yousef is only one of thousands of school teachers in areas of Yemen controlled by the rebel Houthi movement who have been forced to find an alternative income after not being paid for a year. "I have two children, my wife, my little sister and my brother, and I am the only bread winner for all of them," he told the BBC. "The kids want to eat. When they fall ill, they need medication. And if we do not pay the rent, we can be expelled from the place we live in," he added. "There was no option but to quit." A conflict in Yemen has divided the country and brought the economy to its knees. The UN says more than 8,500 people, most of them civilians, have been killed since March 2015, when a Saudi-led Arab coalition launched a military campaign in support the government of exiled President Abdrabbuh Mansour Hadi in its battle with the Houthis. The war has also left 20.7 million people in need of some form of humanitarian assistance and led to a cholera outbreak that is believed to have affected 775,000 people and caused 2,130 deaths. Education is one of the many public services to have been affected by the fighting. The United Nations Children's Fund (Unicef) says at least 2 million children are now out of school. More than 1,700 schools are currently unfit for use due to conflict-related damage, the hosting of displaced people, or occupation by armed groups. At least 166,443 teachers - approximately 73% of the national total - have also not received their salaries since October 2016, according to the Unicef mission in Yemen. They are among 1.5 million civil servants only paid sporadically over the past year. The Houthis announced that the academic year would start on 30 September, but a call by the teachers' union for a strike over pay has been widely heeded, with only a fraction turning up for work. Image caption A teacher at a rally in Sanaa carried a sign saying: "Receiving our salaries is a basic right"
Hana, a female teacher at a primary school in Sanaa, told the BBC that alongside the industrial action, teachers had also been making representations to international organisations, including the UN. "But the Houthis are now trying to thwart our industrial action by inviting volunteers to fill in," she said. The strike is not only taking place only in rebel-held areas. Teachers working in territory under the control of the Hadi government are also protesting over pay. Image caption A schoolgirl holds a banner saying: "We will continue in our education"
Khalid Wakid, a deputy head teacher at Shamsan Primary School, says that the proportion of teachers on strike in some schools in Aden is as high as 90%. "This mainly occurs in schools with a high number of teachers appointed in 2011. This is because the teachers appointed that year are paid low salaries - about 40,000 rials [$160; £120] a month." "But the aim of the strike in Aden and the southern areas is to get better pay. We still receive our salaries." The industrial action is crippling what is left of the education system. 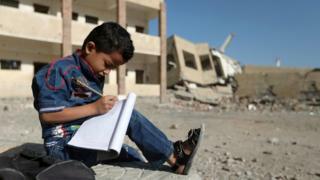 According to figures made available to the BBC by the Unicef mission, 12,240 of the 15,826 functioning schools in Yemen are affected by the strikes. "A total of 4.38 million school students attend these schools - 78% of all students in Yemen," said Rajat Madhok, the mission's chief of communication and advocacy. Unicef says more than 600,000 children have benefited from the rehabilitation of 754 schools, and that 166,287 students have been supported through new and repaired school desks. Almost 800,000 students have also been provided with basic learning supplies such as school bags and other kits. But this is still a small proportion of the children whose future is another casualty of an increasingly damaging conflict.